The many different varieties we have in the area, both modern and historic ones, are a key part of our orchards’ heritage and an essential element in their conservation. But identification can be challenging, only usually possible when there are mature fruit and even then often problematic – unless you are an expert (and sometimes even then!). This part of our website gives some guidance on identification techniques and processes with links to where you can find out more information. This is a relatively new initiative – aiming to help identification through a comprehensive online resource. It is run as a community project that anyone can help with. There is great interest in getting orchard fruit varieties identified accurately. However, skilled identifiers are few and reference material for identification has been sparse. 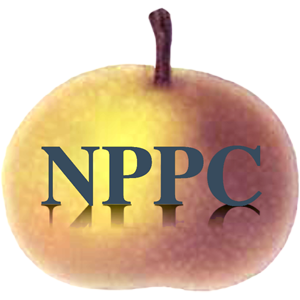 Our project is for pomologists, orchardists and fruit enthusiasts. It is an encyclopaedia of cultivars as well as a tool to assist identification of unfamiliar varieties. FruitID is a volunteer community project that is free for anyone to use. Critique and offers of editorial input are very welcome. Do visit the site and try it out – and register and/or volunteer if you can help. As more fruit is photographed and logged, the site will become more accurate. This is a community effort with expertise given and published free. Teams from several conservation/orchard groups have joined in and membership is spreading geographically. There is a forum for members to provide feedback on varieties. 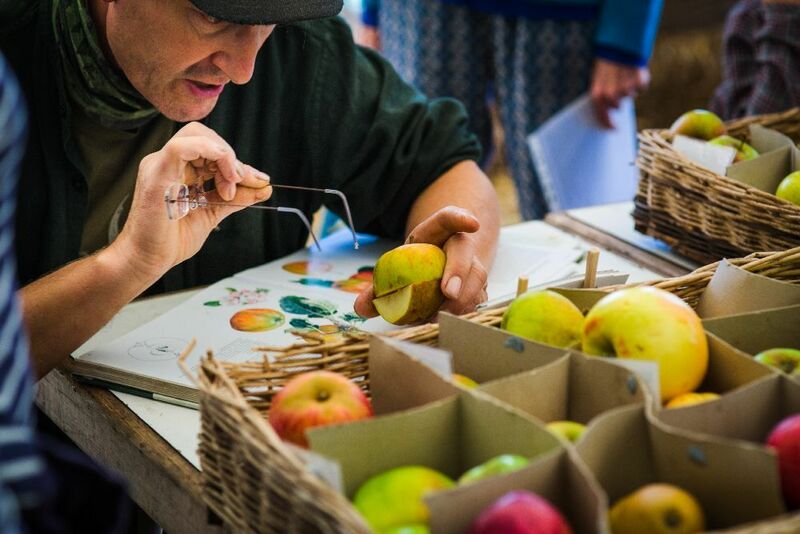 Although cultivars are initially taken from Brogdale Horticultural Trust/National Fruit Collection, local orchard groups (including Gloucestershire Orchard Trust and the National Perry Pear Centre/Hartpury Heritage Trust) are adding to the database with their local knowledge. Dave Kaspar demonstrating how to identify an Apple. Pic by Mark Saunders. At GOT we get scores of identification enquiries each year but we do not have the manpower to offer an identification service ourselves. Charles Martell, the author of our Pomonas on apples and Pears, is not able to offer an identification service, unless for specific reasons (contact us first). However there are many people and organisations who can help, including many GOT members. Some options are outlined below. Some of the older classic keys to identification will be made available via our Members’ Pages soon (that part of the site is being constructed in January 2018). Before you start: Please bear in mind that varieties are not always easy to identify. There are, for example, over 2500 varieties of apple in the UK. It can take many years to build up the skills needed to identify correctly and, inevitably, some of the expert services will charge for identification. Do also note that named varieties are always from grafted stock. If your tree is known to have been raised from seed, it will be a unique and therefore nameless cultivar and its fruit should not be sent for identification as this will be impossible. We ask that you send a minimum of three to six mature specimens should be provided, which cover typical shape, size and colour; it would help if this also show examples of variability in typical characteristics. We recommend that King fruit are not included; these are the apples that form at the centre of the truss, they mature earliest, are usually the largest, frequently have a thicker and shorter stalk than usual and sometimes a flesh protuberance by it. Leaves may sometimes be useful, but don’t worry if you don’t collect them. With each variety submitted please enclose your name and details about the apples on the form so that we keep track of submissions. It is best to pick the apples and send them only a little before they are ripe, and certainly not if they show any sign of decay. We ask for your opinion whether the apple is best used as eater or cooker and when the apples become ripe, and when it is best for use. This does help us narrow down what are the possibilities. Also it helps to know if the tree is about 20, 50, 100 years old (trunk diameter is a bit of a surrogate measure for standard trees, with trees under 150mm (6”) diameter likely being no more than 20 years). Varieties such as Saturn and Scrumptious won’t be growing on a 50 year old tree, nor will Braeburn, Crispin or Gala on a 100 year-old tree. A form is available on their website to record details and send in with your fruit. MAN charge a fee for this service – £5 for MAN Members, £10 for non-members. Brogdale, home of the National Fruit Collection, also offer an identification service in season. Like MAN, they have a specific list of requirements and a form to send in with the samples. They charge £25. You can find Dave and Helen on their stall at most Stroud Farmers’ Markets (though they will usually be very busy!) or at their Apple Day events in October. They offer an informal ID service free of charge, for a maximum of 5 varieties, but would then recommend going on to use the Marcher Apple Network service (above) for ones they can’t be sure of. Provide at least three specimens of each pear, they should be typical fruit, neither bruised nor imperfect, and should have reached maturity, showing characteristic size and colour. With stalk intact. If possible, bring a few leaves in good condition. If you are leaving more than one variety, please be sure to label them so can tell which is which when you receive a reply. Give as many details as possible, eg the soil, age of the tree, how regularly it crops, its shape (photo helpful). An email address or s.a.e. for the reply. There is a fee of £5 per variety to help towards the cost of maintaining the national collection. For full details of how to contact Jim click here for instructions.